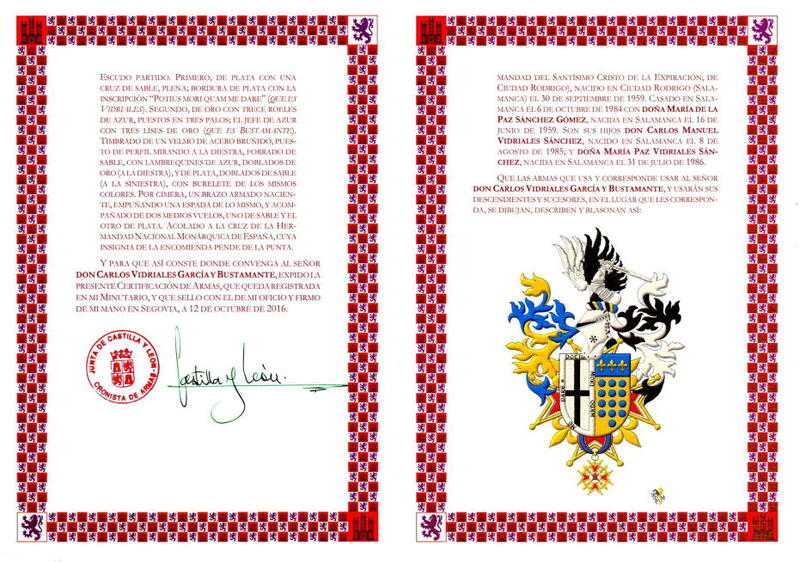 Lineage: Carlos Vidriales, certification, cover and page 6. Carlos Vidriales, certification, pages 3 and 6. 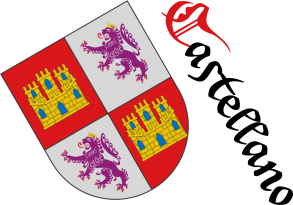 Arms of Carlos Vidriales García Bustamante painted by me in the Certification of the King of Arms of Castile and Leon Alfonso de Ceballos-Escalera and Gila, Marquess of La Floresta, Viscount of Ayala and grand of Spain. 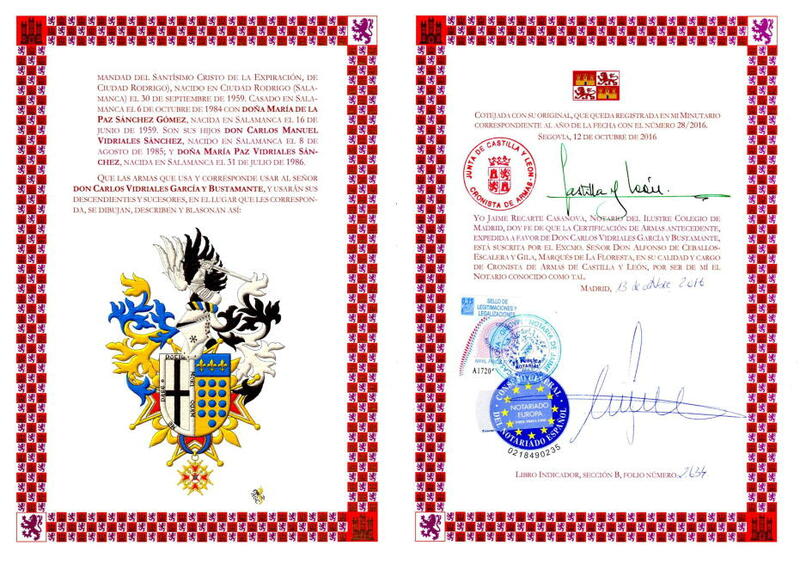 The image shows the cover and the page 6 of this certification. 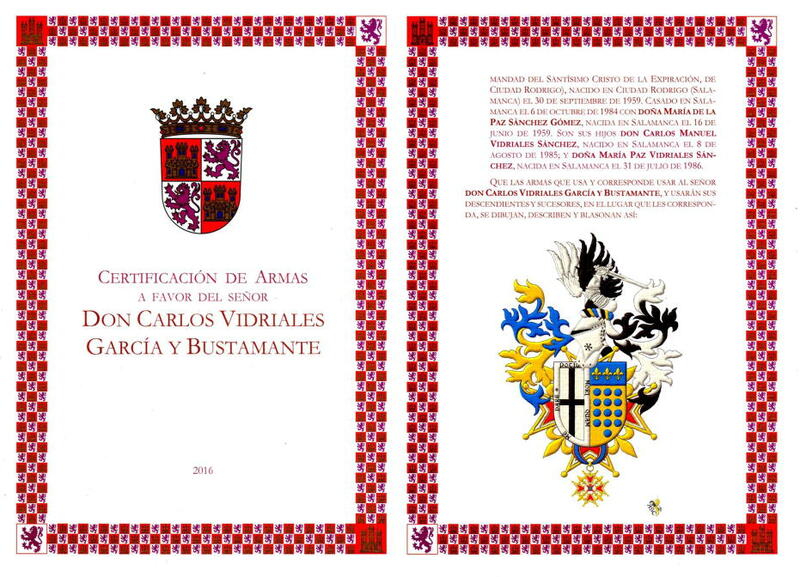 Arms of Carlos Vidriales García Bustamante painted by me in the Certification of the King of Arms of Castile and Leon Alfonso de Ceballos-Escalera and Gila, Marquess of La Floresta, Viscount of Ayala and grand of Spain. 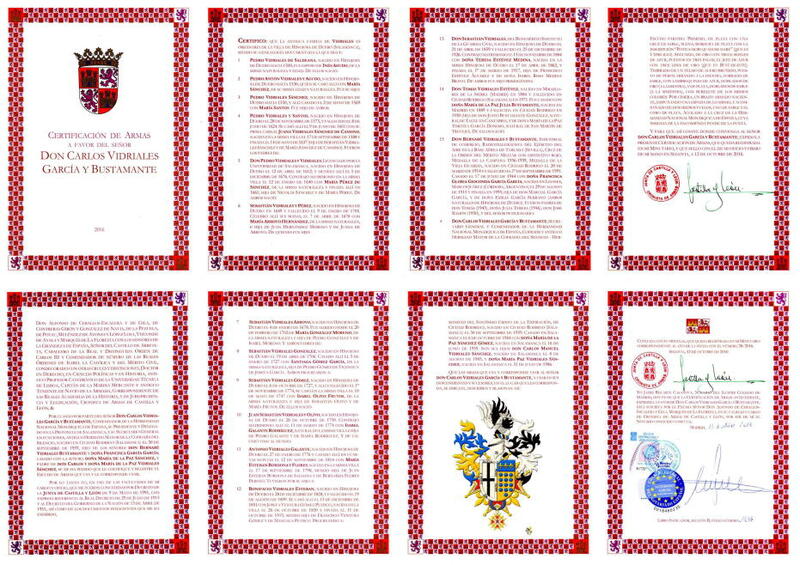 The image shows the pages 3 and 6 of this certification. Categories: Coat of arms, Interpreted, Personal, Semi-circular, Illuminated, Outlined in sable, Party per pale, Argent, Cross, Sable, Bordure, Motto (motivation), Or, Thirteen, Hurt, Hurt, torteau, pellet, pomme and golpe, Azure, Three, In pale, Four, Five, Chief, Fleur de lis, Lineage, Accolé, Decoration, Cross, Suspended, Base, Surmounted, Over all, Label, Cadency, Cantoned and Martlet. Pablo Plaza is the author of the photograph. 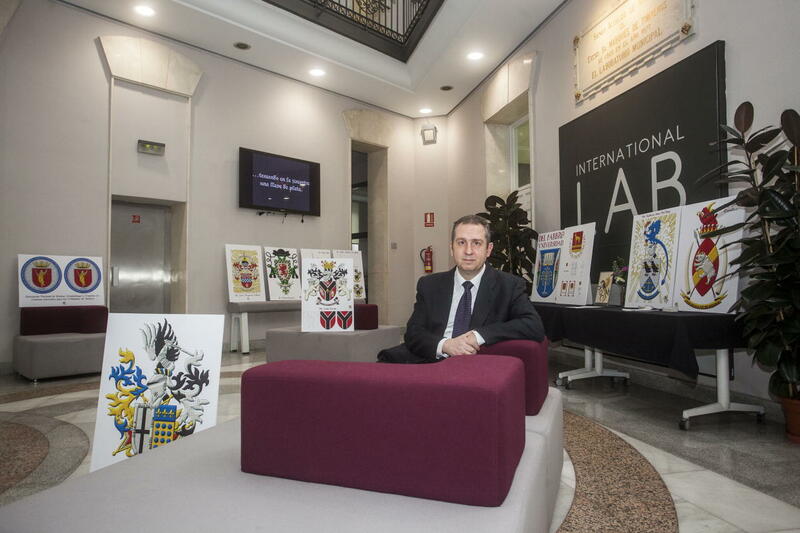 Antonio Salmerón y Cabañas is the author of the heraldic art of the coats of arms photographed. 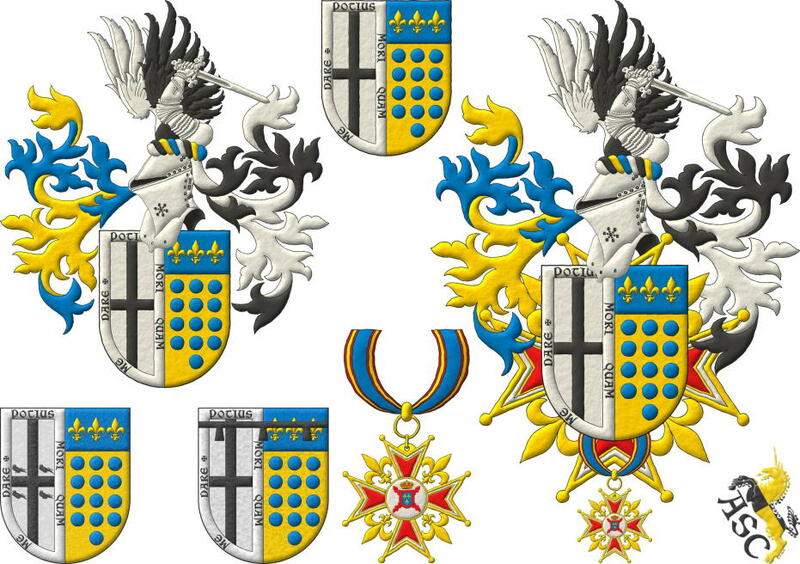 Categories: Photographic format, Coat of arms, Interpreted, Personal, Semi-circular, Illuminated, Outlined in sable, Party per pale, Argent, Cross, Sable, Bordure, Motto (motivation), Or, Thirteen, Hurt, Hurt, torteau, pellet, pomme and golpe, Azure, Three, In pale, Four, Five, Chief, Fleur de lis, Lineage, Accolé, Decoration, Cross, Suspended and Base. 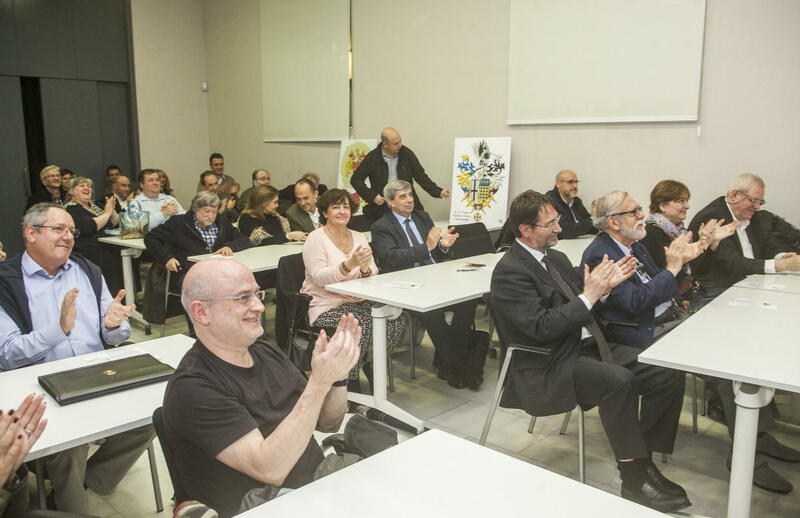 Credits: Pablo Plaza is the author of the photograph and Antonio Salmerón y Cabañas is the author of the heraldic art of the coats of arms photographed. Accolé, Azure, Bordure, Cadency, Surmounted, Cantoned, Certification, Five, Decoration, Cross, Cross, Four, Outlined in sable, In pale, Coat of arms, Fleur de lis, Photographic format, Personal, Illuminated, Interpreted, Chief, Label, Motto (motivation), Lineage, Martlet, Semi-circular, Or, Party per pale, Suspended, Argent, Base, Hurt, torteau, pellet, pomme and golpe, Hurt, Sable, Over all, Thirteen, Three and Vidriales García y Bustamante, Carlos.